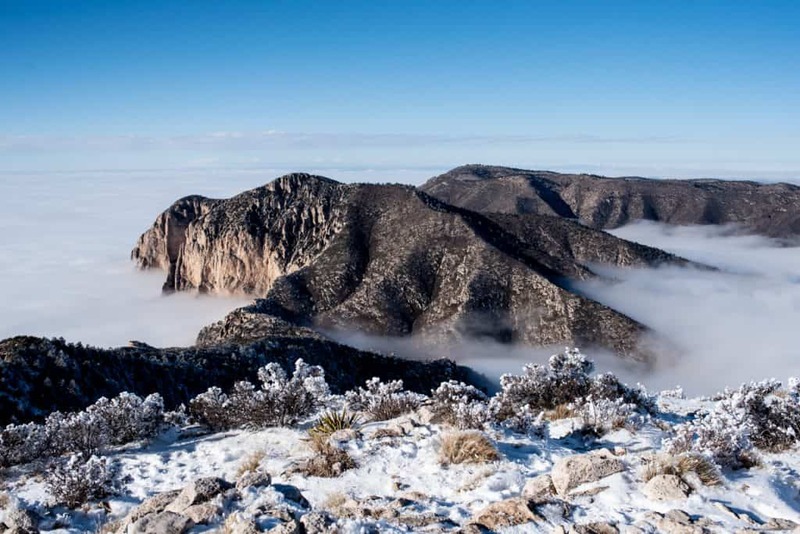 Two hours from the nearest major city lies Guadalupe Mountains National Park, one of the two National Parks in Texas. 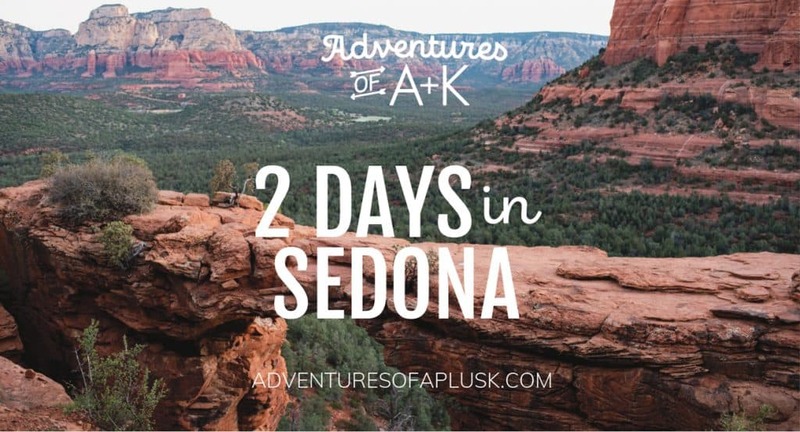 Although we both lived in Texas for a very long time, we hadn’t heard much about this park before planning our road trip and weren’t sure what to expect. With 225,257 visitors in 2017 (a big jump from 2016), it gets about half of the visitors of Big Bend National Park and is one of the lesser visited parks in the US National Park system. But despite its lack of extreme popularity, the park is pretty dang cool! 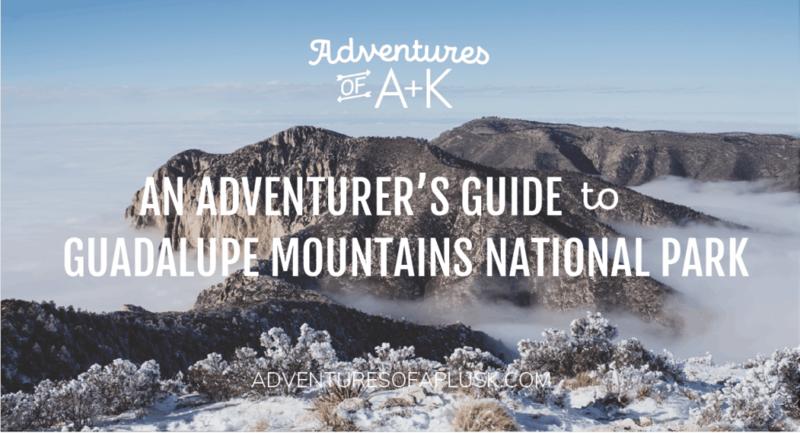 It’s home to 8 of the 10 tallest peaks in Texas, including the highest, Guadalupe Peak. It also has some diverse scenery, from mountains, to canyons, to sand dunes, to forests, to snow if you’re lucky like we were. There were many times that we forgot we were in Texas! 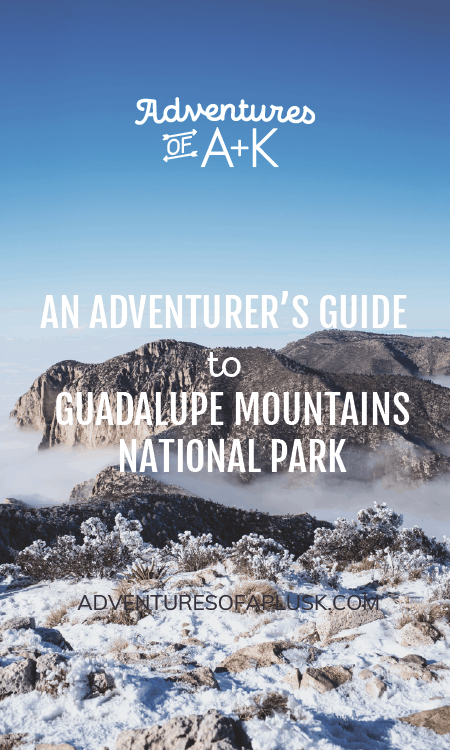 If you’re looking to experience a Texas hidden gem, here’s our guide to Guadalupe Mountains National Park to help you plan your adventure! 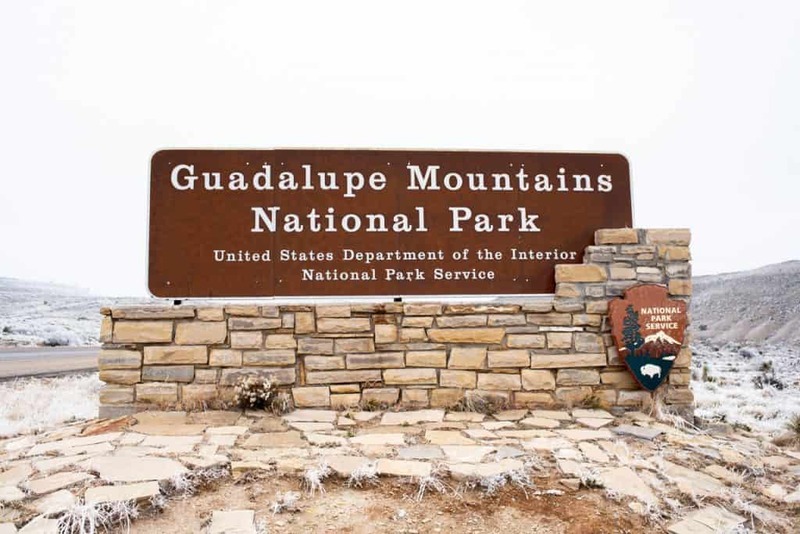 As we mentioned above, Guadalupe Mountains National Park is pretty far from any major cities–it’s 2 hours East of El Paso and 1 hour SW of Carlsbad, NM (which is a smaller town). 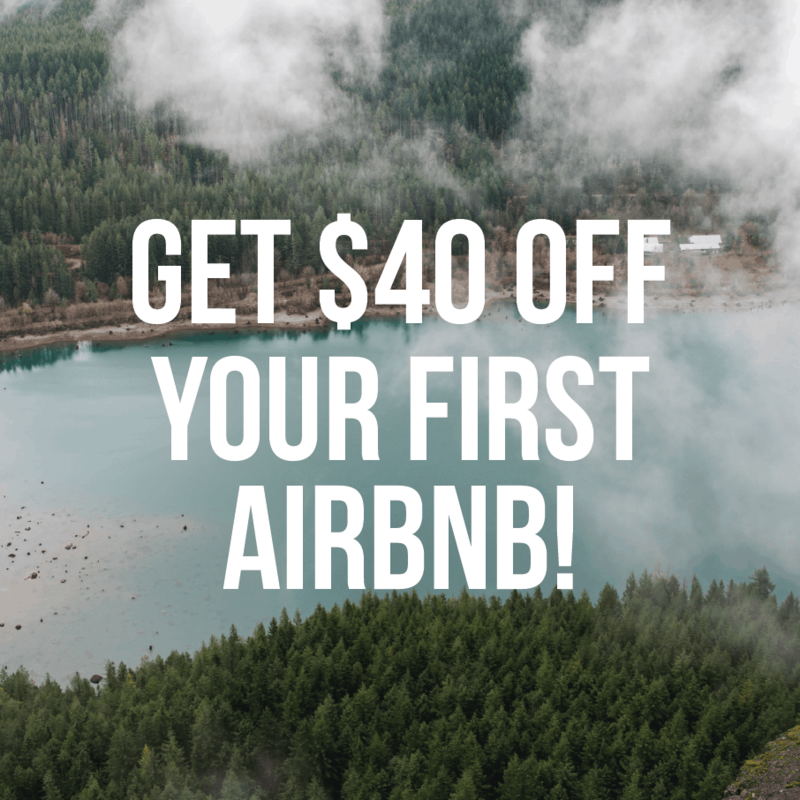 Where to stay depends on where you’re coming from and if you plan to add on any adventures after Guadalupe Mountains (see our suggested list at the end of this guide! ), but here are a few options for you! If you want to be in the heart of it all and don’t mind roughing it a bit, we recommend camping at Guadalupe Mountains NP! 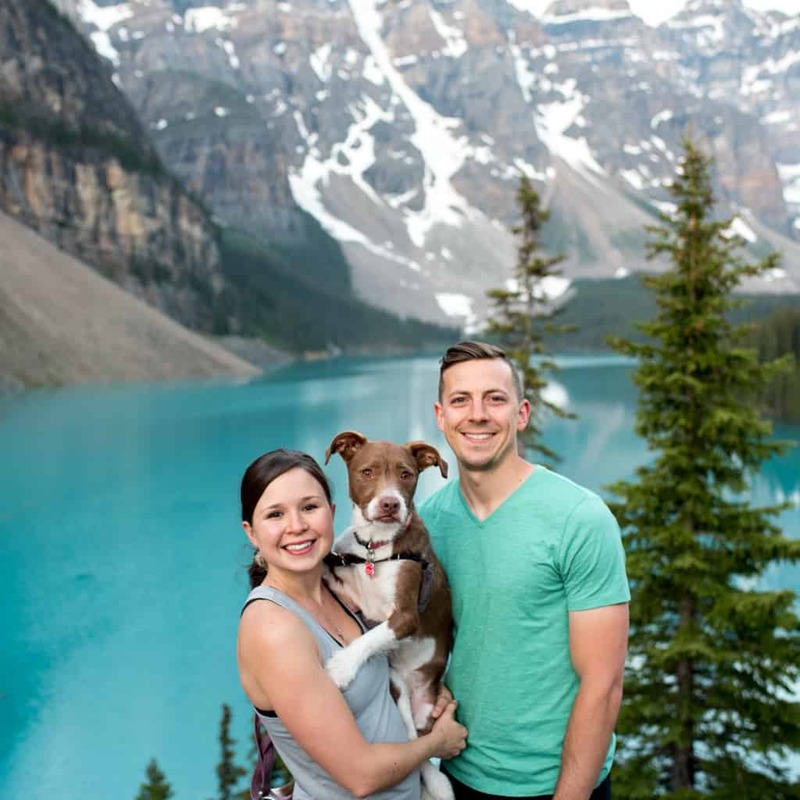 They have two non primitive campgrounds to choose from: Pine Springs and Dog Canyon. 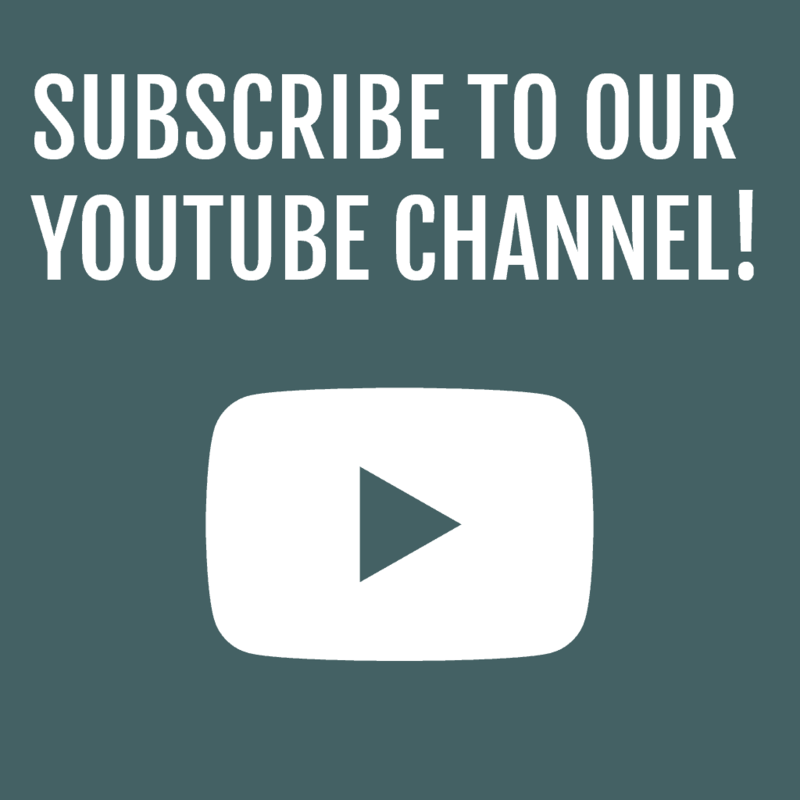 More information can be found here! Note: Camping is first-come, first-serve. We’re going to switch things up for this travel guide. Normally in our travel guides we provide an actual itinerary, but since you could easily spend a day at the park doing just one thing, we thought it would be better to give a list of the top things to do in the park, with estimated length of time for each one, difficulty, etc so you can mix and match your own adventure! 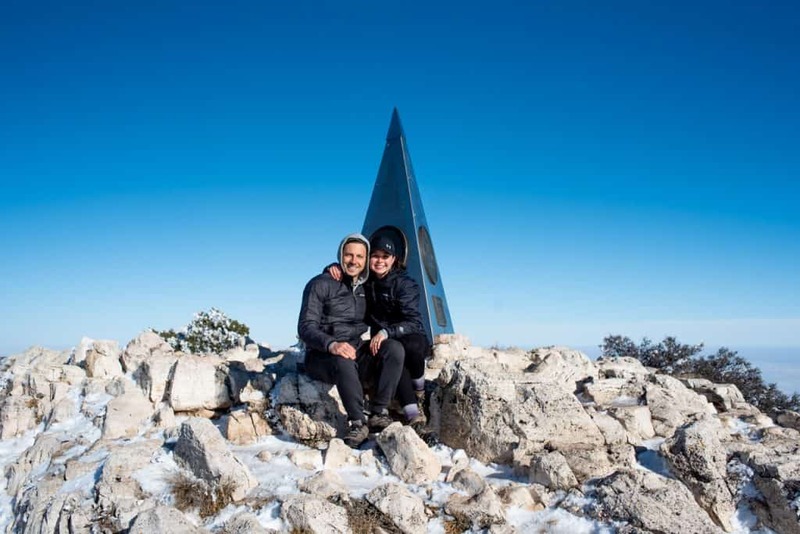 If you only have time for one thing at Guadalupe Mountains National Park, you MUST hike to the top of Guadalupe Peak, the highest point in Texas at 8,751 feet. Not only is it pretty cool to say you’ve been to the top of Texas, but the hike itself is really beautiful! When we went, we battled snow, ice, and fog, so we didn’t get the typical experience, but once we busted through the clouds, the view was amazing! This hike took us 5 hours and 45 minutes, including a break at the top, but without the ice and snow (microspikes would’ve been very handy!) it would’ve likely been closer to 5 hours. However, the NPS suggests it takes 6-8 hours, as it’s pretty steep and challenging. When you reach the summit, make sure to sign the log book! Salt Basin Dunes is about an hour drive from Guadalupe Peak (and in a different time zone), but totally worth the trek! We were unable to visit White Sands during our road trip because of the government shutdown and this was an incredible Plan B, especially because we were the only people at the dunes. After parking in the Salt Dunes Basin parking lot, head on the mile trail towards the dunes. You won’t be able to see the full dunes at first, but as you make your way down the path, you’ll eventually start to notice larger hills of sand on your right side. 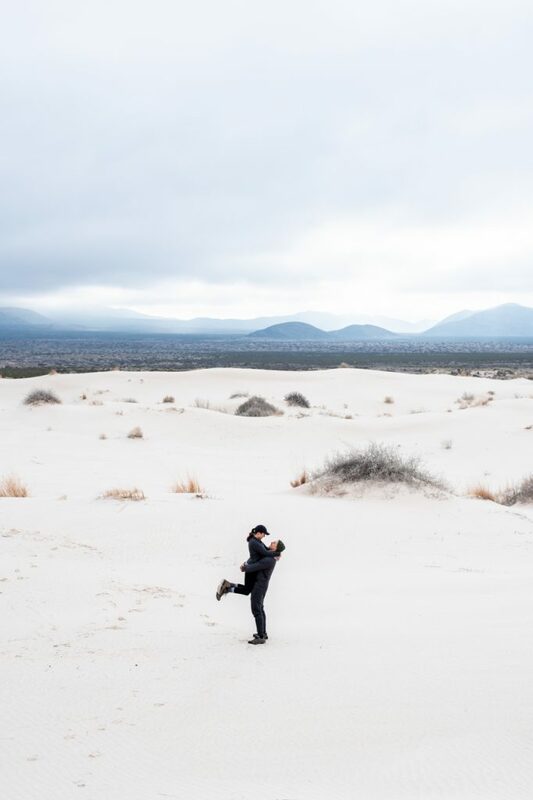 Follow a pathway up the side of the sand hill and you’ll be treated to a view of 2,000 acres of white sand with the Guadalupe Mountains in the background. It was beautiful! Wander around the sand for a bit before walking a mile back to your car. Note: Unlike White Sands National Monument, sledding is not allowed here. Also, this part of the park is in a different time zone (Mountain Time) than the rest of the park (Central Time), so keep that in mind! The next three trails are ones that we did not have time to do, but have heard awesome things about! Devil’s Hall Trail is a shorter and easier hike option at Guadalupe Mountains that takes you to a narrow canyon called Devil’s Hall. The first mile of the hike is a maintained trail, but once you start the second mile, the trail becomes unmaintained, but follow the wash and you will be able to find your way to Devil’s Hall. On your way, you’ll climb up the Hiker’s Staircase, which is a natural rock stairway and have to scramble around some boulders, so keep that in mind in case you have any injuries that would make that tricky for you! There are quite a few options when it comes to exploring McKittrick Canyon and there is something for everyone! One of the reasons McKittrick Canyon is so loved by visitors is because of its bright fall foliage, so to see it in its prime, try to plan your trip for the fall. There are also lots of fossils in the canyon, as part of the canyon is a fossil reef that formed 260-270 million years ago! 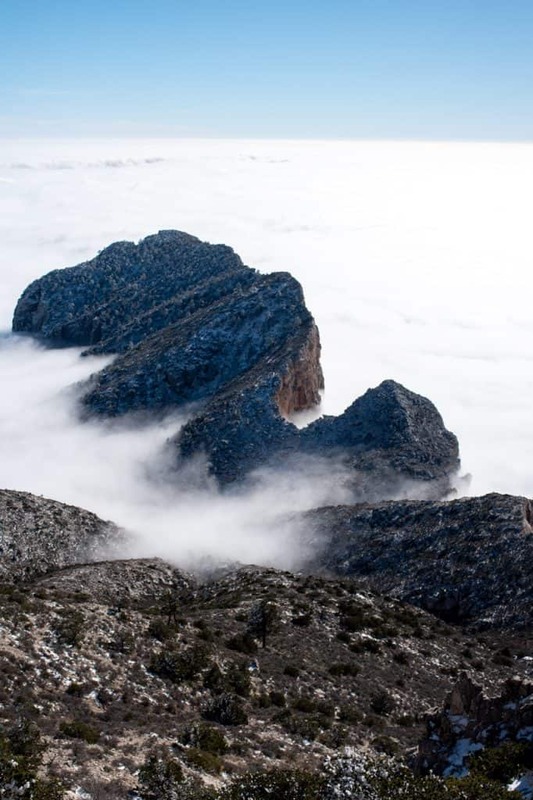 Plan for a full day hike when tackling The Bowl at Guadalupe Mountains National Park. This hike is unique because of the different types of environments you get to experience along the way. You start the hike in the desert, through a canyon, and end in a coniferous forest. 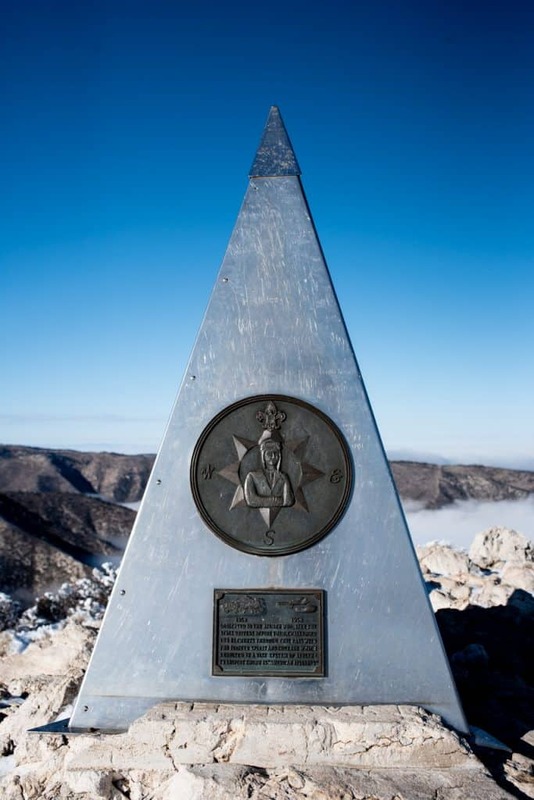 You can also take a quick detour to Hunter Peak from the hike as well, which is the 6th highest peak in Texas! 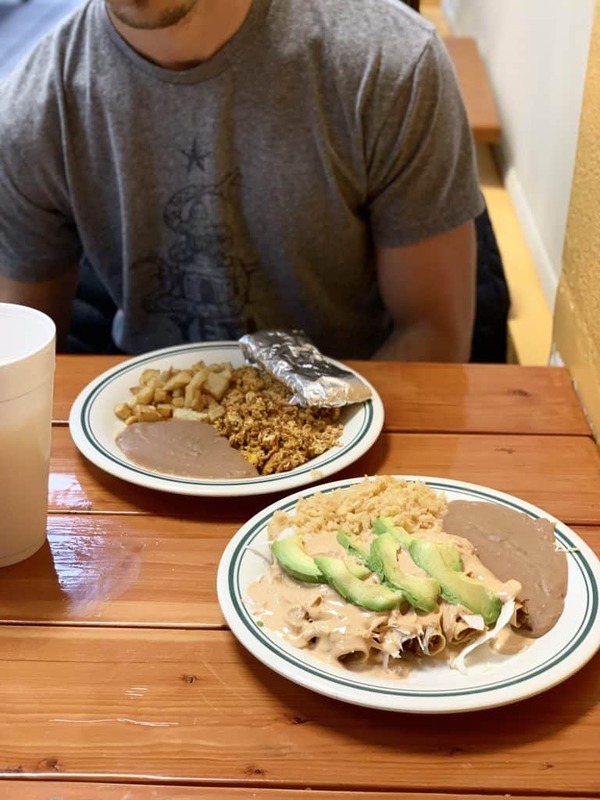 Depending on where you’re staying the night, here are a few suggestions of places to eat dinner after a big day exploring Guadalupe Mountains National Park! El Taquito: They are only open until 4 PM, but we had to mention it anyways because it was one of our favorite meals of the trip! L & J Cafe: This spot is an El Paso institution and the food was super good! We got the chicken enchiladas and the shredded beef tacos and both loved our meals. We also got queso and guacamole, which was delicious. Be prepared for a bit of a wait, as it gets very busy here! You MUST go eat at Carniceria San Juan De Los Lagos! This place ROCKS! It is a Mexican meat market and store with a restaurant as well (the menu is in Spanish). 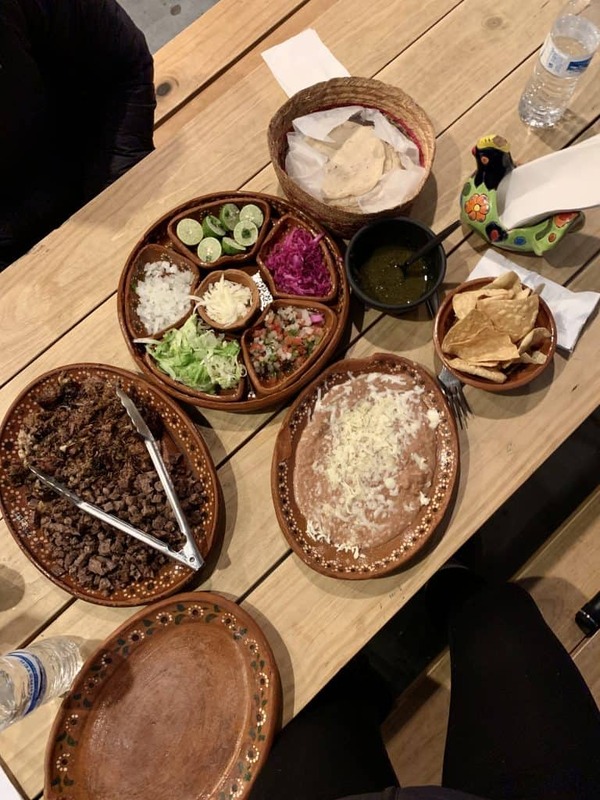 We got the Combos with barbacoa and asada, which also came with rice, beans, tortillas, and chips and salsa. It was a ton of food and very delicious! There are no restaurants right by the park, so your best bet is to bring your own food or head into Carlsbad for dinner! Marfa + Big Bend National Park: It’s 2 hours to Marfa and 3-5 hours to Big Bend National Park (depending on what part you go to). 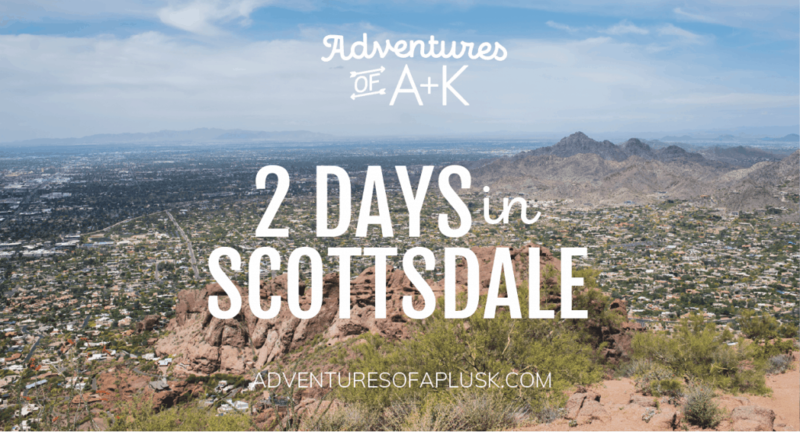 If you plan to add this one, read our 3 Days in West Texas guide here! 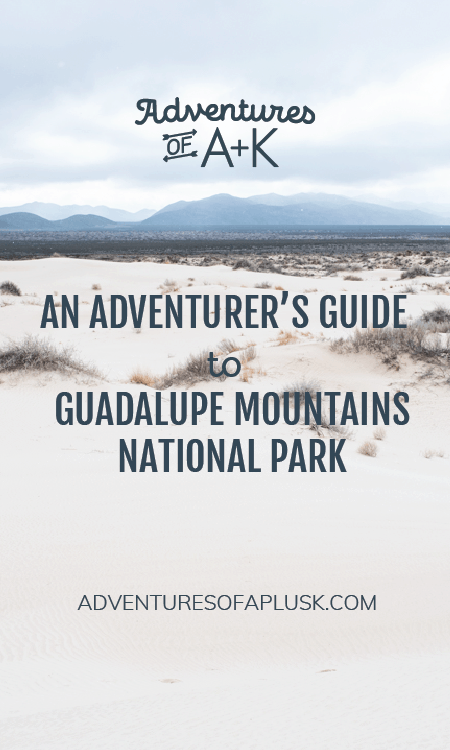 Ready to conquer Guadalupe Mountains National Park? You would’ve been scared during this hike! Lol! But the food was an awesome reward at the end!